When Kevin Poulsen was 17, he used his primitive TRS-80 "color computer" to hack into the US Department of Defense's Arpanet, the predecessor of the Internet. He wasn't prosecuted. He was later a computer programmer at SRI and Sun Microsystems, and worked as a consultant testing Pentagon computer security. In 1988, when authorities suspected Poulsen had cracked a database on the federal investigation of Ferdinand Marcos, they came after him, and he disappeared. 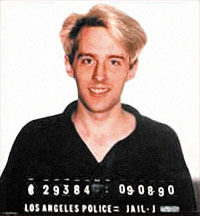 As a fugitive, Poulsen needled the FBI by hacking federal computers and revealing details of wiretaps on foreign consulates, suspected mobsters, and the American Civil Liberties Union. He also hacked into the details on FBI front companies. At the highest levels of U.S. law enforcement, they started calling him "The Hannibal Lecter of computer crime". During his 17 months on the run, Poulsen and two friends, Ronald Austin and Justin Peterson, hacked phone lines to radio station KIIS-FM 102, ensuring that they'd be the "lucky" 102nd caller. Between them, they won two new Porsches, $20,000, and two Hawaiian vacations. When Poulsen was featured on Unsolved Mysteries, a reality crime-solving show, the program's 800 number went dead as Poulsen's picture came on the screen. But Poulsen was captured shortly after the episode aired in 1991, when employees in a supermarket recognized him and tackled him in the aisles. Poulsen later said he regretted shopping at the store, and was considering organizing "a high-tech boycott". The feds finally had their "Hannibal Lecter", but they weren't sure what to do with him. After all, he'd made himself into the man who knew too much. Poulsen was held without bail for five years, then charged with money laundering and wire fraud, while more serious charges were dropped. He was sentenced retroactively to "time served" -- five years -- and his eventual release came with the stipulation that he not touch a computer for three more years. He's now allegedly a law-abiding citizen, and regularly touches computers as a columnist for Security Focus, a security clearinghouse website. Poulsen poo-poos the idea, beloved in law enforcement circles, that only tougher laws, longer sentences, and powerful federal agencies can "protect us" from nefarious hackers -- or, as they're often called for dramatic effect, "cyber-terrorists". Poulsen hates that word, by the way. "Press and public alike", he says, "forget that terrorism traditionally involves some sort of terror". Poulsen's adventures were detailed in a thriller biography, The Watchman: The Twisted Life and Crimes of Serial Hacker Kevin Poulsen, by Jon Littman. Poulsen has said he didn't much care for the book.